Long ago there was Galactic Civilizations II, Galactic Civilizations II: Dread Lords, Galactic Civilizations II: Dark Avatar and Galactic Civilizations II: Twilight of the Arnor. While Twilight of the Arnor is often considered the best of the GalCiv II series, for many it was really Dark Avatar that took GalCiv II from being a good to a great game. This month, we released the second expansion to Galactic Civilizations III. Crusade is a similarly major change to the base game's replayability. 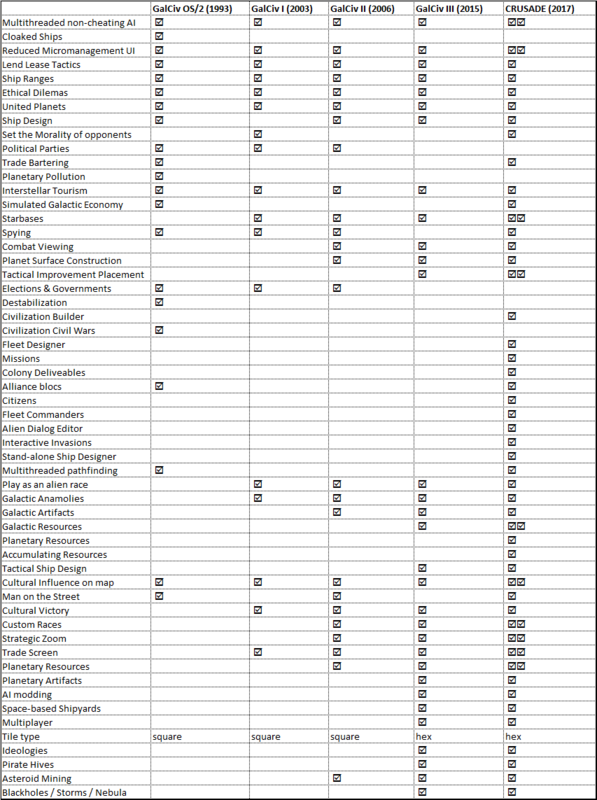 Below is the chart that compares the various GalCiv games over the years so that you can see what has been updated. With Crusade, we added a double checkbox if that area has been significantly improved. One of the most common questions we've seen is how one adjusts their economy. In the base game, the player had the production wheel. In Crusade, you use the Leader citizen and move them to the areas you want your economy to focus on. Over the course of a Crusade game, the player can gain greater and greater precision over their civilization. In the base game, you switched between Research, Manufacturing and Wealth. In Crusade, players can also focus on Approval, Farming, Influence, Diplomacy, Administration, Ship HP and more. We do intend to update the launcher to make it easier to move between Crusade or the base game. This is particularly useful for multiplayer but there will, no doubt, be players who want to quickly transition back and forth if only to notice the differences. By far the biggest complaint about Crusade is that it's buggy. To that, I would have to agree. While there weren't any type 0 bugs in the release, there were an unacceptably high number of what we'd call an unacceptable number of type 2 bugs and a lot of type 3 and 4 that simply slipped by. In addition, a type 1 bug made it through (stuck turn) which was largely the result of my fixation on reducing turn times. While this has since been addressed, I should have left good enough alone by the end of March rather than pushing it and pushing it (I have a local build that has incredibly smooth late game performance but...wait for it...has the occasional stuck turn. The more CPU cores one has, the more challenging it gets bringing a game turn back together. That's why I have a 10 core CPU. Not because I wanted it. But for you. That is why I made the heroic sacrifice of upgrading to a 10 core CPU...cough. We have great fans and we are grateful for the support we've gotten. I apologize for us doing too much too fast. A lot of this could have been rolled out over the next year. In an alternative world, where Stardock isn't run by a lunatic programmer, we would have had Crusade = GalCiv III + Espionage + Civ Builder + Interactive Invasions + 3 new races and a campaign and called it good. Instead, we have...well you see the above chart and I pulled the campaign so that we could have more sandbox features and allow me to write the Apocalypse storyline with our lead writer, Chris Bucholz, later. We have a thread that discusses what improvements from Crusade should go back to the base game. Certainly bug fixes and AI improvements. We want the base game of GalCiv III to be as good as it can be without anyone ever having to buy anything beyond that. We'd love to hear your favorite features in Crusade. I love the Citizen system but I think I end up enjoying the missions feature the most as I really hate late game micro. What are some of your favorite parts? What would you like more of? There's a number of loose ends on the AI I want to button up in the near future. I finally found the reason why late game you'll see AI ships streaming all by themselves. They're trying to reinforce other planets that are super far away. Not a good idea though so I fixed that up. There's a laundry list of other things I am hoping to get done in the relatively new future as well. The roadmap for Crusade mainly focuses on making it easier to mod it. The timeline for it really boils down to how many engineers I can assign. Crusade currently has a "mixed" Steam score. As a practical matter, if our player base doesn't like Crusade, then there's not a lot of incentive to dedicate resources to it. Once we finish the bug squashing, we'll see where things settle at. Galaxy Builder: Let's people use Steamworks to share tech tree parts, planetary improvements, citizens, promotions, missions, flavor text, player abilities, Starbase modules, components. We are able to do this because in order to do Crusade as a DLC, we had to develop a way to make it so that a mod could more easily override or extend existing data robustly. Galactic Empires: This is similar to the system we had in GalCiv II. There's be an overall galaxy players could play on. They would have a dedicated civilization for this using cannon traits (no making "god traits") and each day a new "sector" of the galaxy would be made available for people to play. The results would go towards their empire's score with control of the galaxy being based on total scores. Admiral Battles: We are considering (depending on sales) letting flees that are commanded by an Admiral (a promoted Commander) have tactical control over their battle. Right now, GalCiv III has tactical battles, it's just that they are forcibly put to auto-resolve (there's no UI to control units of course but if you watch the battle closely, you can see that the plumbing is there). Only Admirals would be able to do this because GalCiv is not a game where the fate of your galactic civilization is based on an Ender Wiggin like leader. Just as contested invasions are rare, Admiral battles would be very rare. Arena Multiplayer: We would really like to make Crusade be a really good multiplayer game. While Multiplayer wasn't our focus, the Citizen system was developed with multiplayer in mind as it drastically reduces the cheesy gamey exploitation techniques that the base game has in multiplayer. Arena Multiplayer would be similar to the Galactic Empires except each day, a random, Arena sized map (think very small map) would be made available. These would be for friends or strangers to play each other in. There would be 1 on 1 and 2 v 2 maps with the entire match likely to last between 30 minutes to 90 minutes depending on the circumstances. The upcoming Turn-Time counter would help ensure that the game moved along (see what we do in The Political Machine). More MORE AI: At this point, I have a pretty good handle on how they did the original AI for GalCiv III and I think most people notice the AI is much better (and in the case of the AI buying lots of ships, with unearned money, this was actually something in the base game that only became apparent in Crusade because the AI got a lot smarter about when and what to rush buy). A lot of the negative reviews seem like a bunch of people with agendas. Not to say all are unjustified at all. However there seem to be a lot of basement dwellers who can't take the idea of a couple bugs or change in mechanics without soiling themselves or were not satisfied by the original game and have resolved to insta-dislike everything that comes out to spite Stardock. I'm not one for modding. I would appreciate most of all more end game variety such as the Dreadlords making a return or similar end game crises. Or heck, a planet buster that lets me nuke my enemies in vindictive glory. Extra flavor features such as this weren't mentioned in your post but I feel like they'd flesh out the game just as well as any modding tool since the vast majority of players don't mod. The two broad camps that the negative reviews fall into: those who experienced the bugs and those who don't like the new mechanics. The first is totally fair, the second is for the most part more subjective, and given how much has been revised mechanically, is somewhat expected. Many of the reviews in the second camp have outlined how their favorite exploit-crutch (confusing this for 'strategy') has been removed, or cannot back up the argument with anything more than 'I don't like this so qq'. I would argue that those who take issue with the game will be the first to go and write a negative review, and it is certainly a more cut-throat market with all the competition going on. I just hope that steam reviews don't kill off any chance of future content for galciv 3. Most of what I would like in terms of support for Crusade is QoL stuff. Some misc improvements like traits highlighting how it changes your tech tree; having a 'back' button for viewing other empires planets in espionage rather than clicking 'done' and being dumped back to the galaxy map; more of Brad's AI magic. I personally don't care for tactical 'control' of ships, and that is on my list of most 'arbitrarily' requested mechanics in 4x games. More balance passes and polish too would be great. It would also be great if the AI removed 'detached' shipyards from worlds taken and held from them. Something I would be keen for is a starter planet 'builder'. To my mind, that would really add another meaningful element to custom civs. The galaxy builder is a great idea! I'm also pretty warm on more story content. I also read the updated dlc road map, and I am really hoping those things comes to pass. DLC involving the Drath and the Korath are exciting prospects as well as the small outline for a third expansion. Anyhow, I think Crusade is great. Don't see expansions like that all that often these days. Crusade currently has a "mixed" Steam score. As a practical matter, if our player base doesn't like Crusade, then there's not a lot of incentive to dedicate resources to it. We are considering (depending on sales) letting flees that are commanded by an Admiral (a promoted Commander) have tactical control over their battle. Flees, yep I want to see these flees! Sounds awesome! I've been waiting for the game's bugs to clear and allow custom civs in multiplayer before I really tear my teeth into the game, but so far I really like what's been going on, and I love that feedback like this is being done. I wish all the dev team goodluck in tackling these bumps in effort to make Gal Civ be the best it can be. The only thing else I'll comment on is the Admiral Battles on the roadmap. While the idea by itself is neat because it opens a new avenue in Gal Civ, IMO I think it's better to go all or nothing when it comes to GalCiv's tactical battles. While you may say that Admiral battles are intended to be rare, if the use of an admiral would give any substantial benefit in fights, then players will exploit the benefit as much as possible. Be very careful on what tools and mechanics you allow players to have, because they will be abused to their upmost limit. I have been playing GalCiv since the first Windows version. Crusade is by far the best. Don't let mixed reviews get you down, guys. Foggy I have cone to expect rushed releases form you but that is offset by your commitment to fixing issues in a timely manor and your responsiveness to the community. I have said it before (and often) that buggy rushed releases lead to bad review's by those who expect a more polished release. Personally i knew what i was in for when i brought Crusade (sadly not a founder) and figured the growing pains were worth all the great changes. While MANY issues exist, it is a great game and i commend you and your team. 1. Bugs. I had a gamebreaking bug happen with an opposing civ. The AI became too powerful. 3. The pirate bases are too hard to destroy. It took far into the game before I could take them on and I still lost ships. When I had huge tech and had a logistic battle fleet of 210 lasers then I stopped losing ships to the battle stations. 4. I tried pumping influence but it ended up not being very strong or useful in Crusade. It was too powerful in Original. 5. The right-bottom map interface really isn't very helpful and I never used it. It also looks, to me, very aesthetically poor. Thank you Brad for even mentioning this as a possibility. I know this has been a hotly contested topic around this game for years and while I'm very much in the tactical camp I see the wisdom in taking the autoresolve approach given the scope of GalCiv. I'm sure that many of us "tactical junkies" would greatly appreciate it might even bring in a those folks that have sworn off GalCiv precisely because it has no tactical combat. Calling people basement dwellers for thumbs downing a game this buggy is not cool. We've been delivered an alpha release, entire portions of the game still don't work right after multiple patches. Synthetic life is hosed, campaigns are hosed, the balance job is atrocious, and the AI is so full of cheats and stupid that it's scary. Stardock is instead extremely fortunate to be achieving a mixed aggregate for something that, while relatively stable, is even more unfinished than Elemental was. I'd down vote it myself, but I like alpha testing. The saddest part is a really nice version of GalCiv is hiding under all that crap, and whenever they finally finish a 90's deserving product that truly places the third iteration ahead of it's predecessor, it probably wont get much notice. So far I like nearly all the changes of Crusade (although I haven't seen everything yet due to the fact that I had to start over several times because of the bug fixes). The features I like most are the new resource system and the missions, followed by the change that ship weapons now fire individually (although I couldn' see that myself yet since I had practically no fight up to now). Then comes the new starbase mechanic, then citizens. Espionage is good, but not entirely consistent (e. g. espionage by trade; stealing techs at level ultra after calling back the spy). Invasions is better than nothing (haven't seen one myself other than on Twitch), but the mechanic is too simple for my taste. Galactic Empires: does not appeal to me very much, but that's just my opinion. Admiral battles: that I really would like to have. And also: the more modding possibilities, the better. Right down to AI decision modding, but for that we would need a script language and access to all functions that provide information to the AI. Hm, difficult - if you can control some battles I guess a number of ppl will want to control all of them. Which is not what *I* would like to see. It depends also on the details - how fun/time-consuming etc. would player-controlled battles turn out? However, as long the current auto-resolve remains a *real* option I would not complain. *Real* here as in: player-controlled does not make battles way easier so that it would always be the first choice. Re "What would you like more of?" 3. I'd like to be able to determine what icons get used for certain citizen roles, like engineer, admiral etc. Loving most of the changes, so far (especially the citizen mechanic). Galaxy builder: Great, wonderful, looking forward to it! If adding admirals for some limited tactical control (which sounds good) I would also suggest giving commanders some (different) tactical battle options too. Perhaps having both in a fleet for more tactical options or promoting commander to admiral to provide them with the extra options. I'm a fan of a being more hands on with invasions and battles. Perhaps one option could be flee/retreat for when you are surprise attacked by overwhelming force. Looking forward to seeing what new features come to the game. The Stardock Troopers will have to combat these bugs. Maybe that is why the Fleet need more direct input, for they just do the flying! Well, you said it yourself, the release was pretty buggy. To me this was the first SD game I bought on release. I didn't know what to expect as some others here seem to be. I was pretty disappointed. And you know what? I'm still around. I still really hope, you guys will work out the quirks and that I can give input to accelerate that. There is one request I would have for the future. Please take better care of balance. My argument is not about multiplayer. It is about AI. As long as there are major exploits in the game you can either teach the AI to use them, or the AI will fall short every time. And please go the extra mile in fixing them by not completely dulling down the game. 1) Folks don't understand what type 0/1/2/3/4 bugs are. That needs to be explained. 2) The "mixed" steam score is really close to mostly positive. The English language reviews are mostly positive- it's the foreign language reviews that are making it mixed (and only by 1 or 2). You probably could game the system and get it to mostly positive just by spending $100. You also are seriously hurt by founders not being able to impact the review score, which is unfair. 4) In terms of the upcoming features- I'd not work on the Admiral Battles or Galactic Empires. The former will be a headache, and the latter isn't going to move the needle any. More AI and Galaxy Builder would be welcomed, and I think Arena MP could be a really interesting concept if you keep the games under 60 minutes. 4X games have never had a fast MP option before. From my days in the gaming industry as a QA Manager, we used a similar bug categorization (A through D). I would imagine their system lines up pretty much the same but with a extra category for something more appropriate to their software (mine was an MMO, this is a 4x TBS so it will have it's own idiosyncrasies. I like the changes and additions a lot. It needs the bugs fixed and a serious balance and polish. With that, I think the game will be very good. I really like the changes and it makes GalCiv great again! What I very much miss are the clearly different tech trees. The alterations by traits are minor. The Thalan don't feel very different anymore and miss most of their unique style. 1. Bugs. I had a gamebreaking bug happen with an opposing civ. The AI became too powerful. <<<, I have been playing in beta and now. Bugs are minor, I have had zero crashes and few game hangs. I have not experienced ONE game breaking bug since expansion launch. That does not mean your claim is invalid however. 2. The missions are great but they have to be re-added every time on every planet when done. It isn't super clear that an actual ship gets sent out. (mine mostly got eaten by pirates)<< again I play without pirates. They are ok but until we have more interaction with them they are an annoyance more than a fun feature. 3. The pirate bases are too hard to destroy. It took far into the game before I could take them on and I still lost ships. When I had huge tech and had a logistic battle fleet of 210 lasers then I stopped losing ships to the battle stations. <<, you will need to go up the tech tree and bring a larger fleet if you want to destroy bases. Stronger starbases were asked to be put in for years. I am happy they are changed. Currently I simply turn pirates off till we can do more with them. 5. The right-bottom map interface really isn't very helpful and I never used it. It also looks, to me, very aesthetically poor. < I disagree it is a vast improvement over the previous UI. 1) Increase the beta testing time. Many of the small bugs would have become apparent with extra testing from your founders. I understand there are financial imperatives, you need the money to keep on developping, but try to find a way, please. 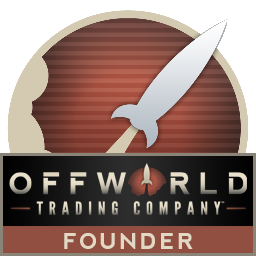 If the number of founders 2years after release is a problem, than open a few new spot, with a special price (say 50% discount if you own the game + dlc + expansion). 2) Document the new features. How things were done in the past, how they are done now. You don't simply add units & features, you change the game mechanics, and it's confusing for many user. I believe these two would alleviate the problem of bad ratings. It got some bad reviews on release, but 1 month later it was already a much better game. But by this time, the reviews are done and the damage is there. Agree with that! I didn't even realize there were differences based on traits until saw a posting about it. I liked the administrators, they do help with micromanagement. But getting one every 10 turns seems contrived and random. I think the number of admins you get per turn should be adjusted by traits, ideology and techs. So you have an average of 10 or 12 per turn, modified by something the player can control. Maybe Stardock can create a number that will spit out a citizen every 10-20 turns that you can train but also a, say, Worker once every 20-30 because your race's traits etc suggest you're all about social manufacturing/building stuff? So, the system doesn't just spam you with what your trait indicates what you want your citizens to be but gives a helping hand in the direction indicated by your race's traits. 2) More AI - Always appreciated. 3) Admiral Battles - depending on what extent you changed/improved battles would determine how excited I would get and much money I would throw at you all. I imagine you could do something like gratuitous space battles and add a little more control on assigning roles/giving orders and placement of ships (so missile ships in the back and ordered to stay at no closer than missile range, with kinetics rushing forward to knife range, etc.) without too too much effort (Would happily pay $5 - 10). You could also go full on Sword of the Stars ("SOTS") type combat with modeling damage (maybe component by component like space empires 4 instead of by section as SOTS), individual/group ship control during combat (individual ship movement direction and ability to assign targets), etc. (Would happily pay $20). Or something else entirely. I think there is an opportunity on the market for a good tactical combat system in a good space 4X. Total war has certainly done well with their merging the two together for fantasy/historical realms. An Arena mode would be nice and perhaps some enhancements to combat FX (turrets that move and shoot, visually showing damage) if you go more SOTS style combat. Enjoying Crusade, keep up the good work.